Revo AXiS review | What Hi-Fi? 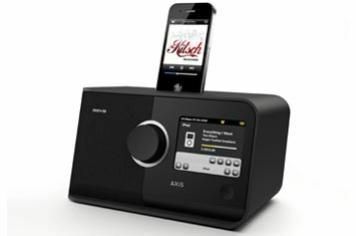 This is very much a table-top radio with its curvy, wedge-shaped cabinet, large controller and colour OLED touchscreen with well-designed menus, plus a top-mounted iPod dock. And it's designed with sound in mind. It's only a mono radio, albeit with stereo headphone and line outputs, but it uses one of NXT's Balanced Mode Radiator drivers, tuned with a rear port and driven by an 8W digital amp, to give an expansive sound with decent bass and good detail and flow. As well as the usual DAB/DAB+/FM, streaming and internet radio, the AXiS comes with a one-month trial subscription to Last.fm. There are also twin alarms and the option of going to sleep to one station and waking to another. All in all, a well-sorted radio, and a fine contender in this sector.